This page is for development of new products only. No products on this page are CURRENTLY for sale. Please respond to the attached requests for feedback. 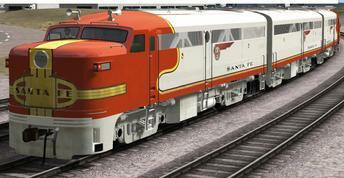 The ALCO FA is a family of B-B diesel locomotives designed to haul freight trains. The locomotives were built by a partnership of ALCO and General Electric in Schenectady, New York, between January 1946 and May 1959. They were a cab unit design, and both cab-equipped lead (A unit) FA and cabless booster (B unit) FB models were built. A dual passenger-freight version, the FPA/FPB, was also offered. It was equipped with a steam generator for heating passenger cars. SEARAILS plans on producing solid color bodies (BLACK, RED, YELLOW) with text and decoration decals for specific roads. Optional DCC and Lighting installations will be available. HOW MANY Z SCALE CLASS "C" @ $599 TO BUY?